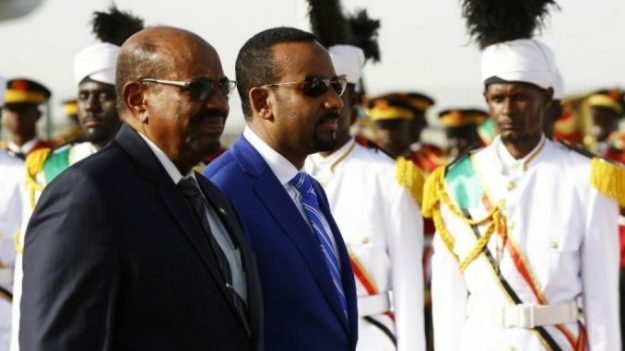 Sudanese President Omar Al-Bashir and Ethiopia’s Prime Minister Abiy Ahmed are discussing plans to form a joint force to protect the shared border between the two countries. The two leaders’ meeting came on the sidelines of the recently concluded 32nd African Union Summit currently taking place in the Ethiopian capital Addis Ababa. According to a statement released by the Sudanese presidency, the two presidents stressed the “importance of increasing economic cooperation between Sudan and Ethiopia, as well as holding meetings of the [two countries’] technical and higher coordination committees”. In August, Ethiopia and Sudan agreed to deploy joint forces along their shared border “to combat terrorism, human trafficking and to prevent any potential security tensions”. Sudan also announced in July its commitment to removing border restrictions with Ethiopia through “Joint Technical Commissions”. The two neighbours have been in dispute over the Al-Fashqa area, which is located at the common border. Al-Fashqa, which is surrounded by water-based insulators, covers an area of about 251 square kilometres.